They were amazing and went over and beyond for our wedding day!!! We loved our trailer that they made us and we couldn't be happier!!! Andrew, Ryan and Mia were such a pleasure to work with! They were extremely flexible and accommodating. We had so much fun with them our entire wedding weekend. They went above and beyond and truly captured our special weekend. We can't stop watching the video! We hired them for both photography and videography and I am so glad we did! 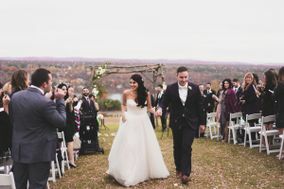 There are so many wonderful images from our special day, and the drone footage is just breathtaking. It was such a pleasure to work with them! Words are not enough to describe the artistry of Shuttersound Pictures. Ryan and Andrew are visionaries who captured us, our families, friends and personalities and made the best wedding video. We got married May 20, 2017 in NJ. We live in San Diego and planned everything from far away. We didn't even meet the duo until the day of the wedding and it couldn't have been easier, smoother and more beautiful. Communication was always spot on, never a delay. Very important when far away. We trusted them completely. The day of the wedding I didn't even notice them there. All the moments captured were so perfect. I had a bridesmaid even ask me that night if our videographers were even working because she couldn't find them, haha. They were part of the crowd, captured all of our guests and moments. Both the short video and long video had perfect edits and music choices. I cried, laughed and smiled the whole time. We showed a friend the short edit who recently got married and she loved it so much she wanted to send them her raw footage to redo her own video. I couldn't recommend Shuttersound Pictures to enough people. You will not regret booking them! We wish them tons of luck in their future! They deserve it! Ryan and the team at Shuttersound did an incredible job on our wedding. We were married at the Liberty House in September. Their communication leading up to the event was crisp and responsive, they were on time and incredibly professional on site, and the finished product was absolutely amazing. This is a very talented group of videographers and you would be making a very wise decision using them to capture your special day. If you still have not found a videographer, look no further, because Shuttersound checks all the important boxes! Ryan and Andrew were absolutely amazing. They are a pleasure to work with from the moment I inquired about their services to the day i received all of the footage from my big day. I had an early wedding so I needed them to begin working at around 7am. They were on time and ready to work! I highly recommend these guys! My whole family can't stop talking about how great our wedding trailer and wedding movie looked. The picture quality was absolutely amazing. We must have watched it so many times. They captured so many wonderful moments! Shuttersound did an amazing job with me video! They were professional, took care of all of my concerns and addressed all of my wants for my video! They even delivered the video themselves... I appreciate the time, effort and patience! Thank you gentlemen for my wonderful wedding video! Very easy to work with. Great service. Very professional. Everyone loved our video...it represented exactly what happened that night and what we wanted to show to the world. Would highly recommend! These guys worked extremely hard and were committed to doing everything they could to ensure that I was satisfied. Even when minor hiccups happened, they were proactive with communication and made sure I was being taken care of. Shutter Sound Pictures was a pleasure to work with and for a reasonable price! Both my husband and I would recommend using them for any couple seeking quality wedding photography. They made sure they had ample staff present to capture varying angles and were more than willing to work with me to help bring my vision to life - even going so far as to following the inspiration examples I shared with them and providing creative and beautiful suggestions for photos. They caught the important moments during both our ceremony and reception, leaving both my husband and myself very satisfied with our final photos from our special day.